… for allergies and khakis. I’ve had both since I was a kid. I have been stopped in my tracks these last weeks by one of the worst allergy attacks I’ve had in a long while. So forgive the randomness that I will spout, I’m working through a haze, headache and malaise. As much as I’d like to crawl back into bed, things must get done. Like errands tat take me to Target. Style bloggers have a tendency to fetishize. Maybe all people do, but it is very pronounced on the web. We rhapsodize about the perfect everything. And, more often than not, that perfect something costs an arm and a leg. Which is why I’m glad that I managed to drag myself through Target. Design plays an important part in our lives, and affordable design is a wonderful thing. Especially, in my opinion, when it comes to clothing and USD$17 khakis. Are they perfect? No. They are made in Vietnam. There is no extra material to allow for alterations. There is no French fly. But, they are stitched with cotton thread, they are 100% cotton, they come in several shades and … they fit nicely. This entry was posted in Elegantology and tagged allergy season, Khakis, Merona, Target. Bookmark the permalink. Hi there, I have been reading your wonderful blog for years now. I lurk and never post. Sorry about that! I must tell you about what helped my allergies though…nasal irrigation. It is probably the most inelegant thing to do! Really. But, after suffering for years, I tried it on the recommendation of a friend. The saline nasal solution at any drug store is less than $4. I tried it and it truly changed my life. I used to shut down with allergies…headaches, eyes swollen shut, sneezing nonstop. Many, many times a year. Now it almost never, ever happens! And every day is better. Gross, cheap, works. I was at the point of taking a daily Claritin when I started irrigating. Now I never take anything, ever. Well, you may wanna delete this gross comment from your pretty blog, but I could not resist trying to help you. I hate to see anyone suffer when I might be able to help. *** Hi! Just read the comment from CINDY (above)…. THANK YOU SOOOOOOO MUCH, as I will be trying this myself!!! I sooooooo appreciate your sharing YOUR personal solution!!! I’m hoping it will be “THE ANSWER” for MY allergy problems!!! This suggestion comes at a good time. My husband needs new khakis–casual, non-precious ones that he can play golf in and then sit and enjoy a casual lunch outdoors. Or putter around the house on the weekend. The expensive khakis are just that–too expensive for the golf course, and better saved for the office, weekend evenings, etc. 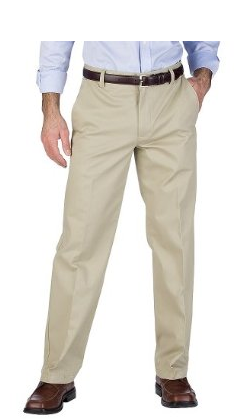 He can pair these trousers with his favorite Target find–white all-cotton polo shirts. Cindy, I use the neti pot, too! On the recommendation of a soprano acquaintance of my mother’s. ;;Revolting, but it does help. Unfortunately, I’m stuck with the claritin/flonase/albuterol route. Paula, I bet he loves them! I got a pair of the vintage relaxed fit and they’re really cut nicely. My husband’s favorite khakis are from LL Bean: $19.99. I think it’s good, and even necessary, to mix high and low. Put your money into a high-quality leather belt and Italian loafers, and spend less on khakis, t-shirts, and shorts. Always invest in accessories! Chris, I can empathise with your allergies. I suffered very badly with hay fever (house dust & pollen) until, in my early twenties, I commenced a course of desensatising injections. It took a while but it was worth all the effort. I’ve been symptomless since then. If only my other problems could be so easliy dealt with. PS – Saw “To Catch A Thief” last Friday. They don’t make em like that anymore! Ian DU, Wow! I can’t imagine being allergy free. TCAT: one of my favourite movies of all times. Mrs.E. and I visited the vista above Monaco where the picnic scene was filmed.